For those who have not read The Greyfriar or The Rift Walker, this review will contain spoilers. The human advance has been halted at Grenoble, and the situation is dire. The newly crowned Empress Adele is fighting a costly war against the European vampire clans. What was once successful Imperial siege on the vampire city has been turned around on the weary and beleaguered Equitorian troops. The human cost has been staggering. Now winter has set in and supplies dwindle as the vampires close in around them on every side. Retreat is no longer possible, the ammunition and food are almost gone. The Equitorian soldiers have reached an impasse – they must stand or die. Then the Empress unleashes the Empire’s greatest, most potent weapon – herself. But while her geomancy could be used to save thousands upon thousands, potentially winning the war against vampires, the wielding of so much raw power presents too many unknowns and consequences that Adele is unsure she could live with. It is a war that cannot be merely won on the battlefield, but with ruthless cunning and calculated subterfuge if Gareth & Adele want to beat vampire prince Cesare at his own deadly game. Adele. The situation has escalated tenfold since the reader has last seen Adele and her beloved Greyfriar. Cesare continues to pursue his bid for power over Britain and the vampire clans, as Adele settles into her role as a ruler of an empire at war. It is a daunting task as she must make decisions that impact countless lives, must mediate disputes between fractious members of her war council, must guard her secrets from those who might betray her, and above all she must present an authoritative, formidable, decisive front to those who would seek out and exploit her weaknesses. She’s been matured by political games, loss, death, and war. And more than that, this is a life she’s been groomed for. Yet even so, the knowledge of what might be required of her to save her people, the knowledge that she’s sending men to their deaths every day, the knowledge that sometimes a ruler must do what they must to protect something greater than themselves, all of this weighs heavily on Adele’s shoulders. For underneath the cool, regal facade she must maintain, lies an uncertain, conflicted young woman of twenty. I love how Clay & Susan have written Adele. From first meeting this young, slightly, naïve girl in The Greyfriar to seeing her stubbornly claim her birthright as well as her love for Greyfriar in The Rift Walker to watching her rule and wage war in The Kingmakers, Adele has grown into a character that I absolutely love. She’s so strong, so determined, so courageous, so loving, so optimistic, and so unwilling to admit defeat. And I think that’s why I love her the most– that last attribute. That she will not give up fighting for what she believes is right, and just, and good even in the face of insurmountable odds. And her tenacity serves her well. Gareth. Gareth in The Kingmakers is facing a bit of an existential crisis. He feels that the need for Greyfriar is fading in the new political landscape of war-torn Europe. He wonders at the futility of Greyfriar, the impact he’s made as the masked hero, as he tries to discern where he fits into the grand scheme of things in the here and now – as a vampire with a conscience, as the prodigal vampire prince who turned his back on his own kind to protect the humans of the north. Gareth has a wonderful duality to him. He’s a fierce warrior, a ruthless vigilante, and a remorseless killer exacting justice upon those he feels deserve it. He’s a cunning vampire prince – pragmatic and practical. He does what he must and can play the game. But when surrounded the small circle of those he cares for and trusts, he’s gentle and kind, with a hilariously dry wit. He’s fascinated by human customs, art, history, music and literature, and these things bring out a wonderfully shy, childlike curiosity about the world that absolutely melts my heart. Another thing that melts my heart? The way he loves Adele, wholly and completely. Gareth & Adele. Their love is a grounding force, a place of solace for them both – it’s the eye of their storm. While danger ever encircles them, and their enemies continue to haunt their steps, while the fear of failure and their own uncertainties plague them, they find strength, assurance and safety in one another. And that is what I love about them together. They are truly in love. They’re honest with each other, kind to each other, willing to sacrifice every for the other. There’s no artifice, no political agenda, no games, no power struggle between these two. When they’re together they’re just Gareth and Adele, two people who’ve built their relationship on mutual respect and friendship. Two people love each other unconditionally, and who are unafraid to be themselves with each other. They are both somewhat dryly humorous and their witty back-and-forth, as well as their intuitive understanding of each other, constitutes some of my favorite moments of the book. All in all, their love story is really quite beautiful, and it really is the driving force of this series. Secondary characters. All of my favorite – and not so favorite – characters are back in this nail-biting conclusion. From Simon’s unflagging lust for adventure, to Anhalt’s steady loyalty, to Mamoru’s questionable zeal, to Senator Clark’s unfailing arrogance, to Flay’s unpredictable aggression, to Cesare’s limitless ambition – the characters the Griffiths populate their well-conceived, steampunk world with are three-dimensional and thoroughly developed. Loyalties are revealed, courage is tested and lines are drawn. It’s the final act, and everyone has a part to play in this grand drama. Story & Plot. This book starts off with a literal “bang,” and barely pauses long enough for the reader to catch a breath. There are a few quiet moments between Adele and her Greyfriar, but then we’re once more plunging headlong into the fray – up to our necks in intrigue, battles of both politics and sword, and always in danger. I confess, I had a few loose predictions going into The Kingmakers about where this book might go, and I have to say the Griffiths surprised me… in a good way. Things didn’t play out quite how I expected (and in some cases, that is a very good thing). The only real issue I have with this book is the pacing of the ending. It felt a tad rushed. That’s not to say it didn’t conclude in some kind of satisfying way. It did. It just felt like it got there a little too… fast? There were also just a few other small things about it, that I can’t mention here, that kept my rating just slightly under five stars. However, despite my minor issues, as the rating shows, altogether, I do love every other thing about this novel. Overall. 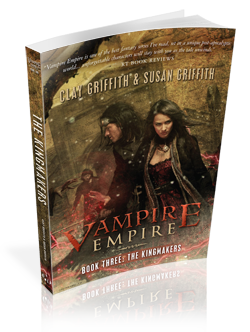 With a sweeping romance, an epic battle between two rival species, a captivating world of gears and steam, action sequences that are almost cinematic, a cast of fully realized characters, creatures that’ll haunt your nightmares, and a plot full of twists, turns and intrigue, The Kingmakers is a thrilling and fitting conclusion to the Vampire Empire Trilogy. Ooh. This series keeps popping up all over the place. I’d never heard of it until this past week and definitely want to try it out. Sounds fascinating and the covers are some of the best I’ve seen in ages. I know. The covers….THE COVERS. Honestly, that’s why I first picked them up, and I was so relieved to find that the inside of these books lived up to their amazing covers. I hope you do get a chance to read these books, Anna! But yeah, you should totally give this series a whirl! Thanks for the review! You have given me hope in vampire books again! Thank you so much, Alina! I hope you’ve gotten your copy by now and have read it and loved it! I had never heard of this book before. I am glad that you read it and posted such a positive review for it. It sounds like a book that I would enjoy. Another book to the TBR, in honor of Dani! I haven’t read the series so I skimmed the review. Surprisingly I haven’t read many vampire books. This book sounds so intense and action packed and the romance sounds breathtaking. I’ll be adding this to my TBR. Oh it is! (Intense and breathtaking) So glad you’re adding it to your TBR!